Pancake Day 2009 is on Tuesday 24th February. Pancake Day’s official name is actually Shrove Tuesday and is the day that Christians use to represent the Tuesday before Lent starts (Lent is the run up to Easter – Easter 2009 date). 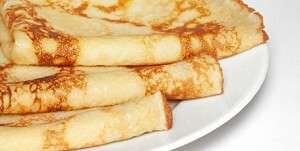 Traditionally on Shrove Tuesday Christians who would observe Lent would use up the rich foods that they had. As Eggs, butter & sugar were not permitted during Lent these ingredients were used to make up Pancakes. Pancake Day is celebrated now by most people with many not knowing the significance of Shrove Tuesday and just like to take part in having a Pancake. Many also like to flip their pancake in the frying pan as a challenge. Regardless of the year Pancake Day always falls on a Tuesday and Pancake Day 2009 is on 24th February.